I doubt we'll get much of a short-term rally until after the midterms, and then I expect some market strength through to the end of the year. The only problem with this view? Everybody else thinks the same thing. Here is a terrific quote from today's column by Mike Burk. Last week began with a sharp rally. Sudden sharp rallies in bear markets are the complement to the sudden sharp declines seen in bull markets. Are we near a bull market top? I don't know, but I do think there is a good chance that we are near the end of this bull market. I think we all recognize that if the market is topping, it will take awhile for the process to play out. I don't have the time to put together a convincing presentation, so I am just going to show many of the charts I like to review, and in no particular order. 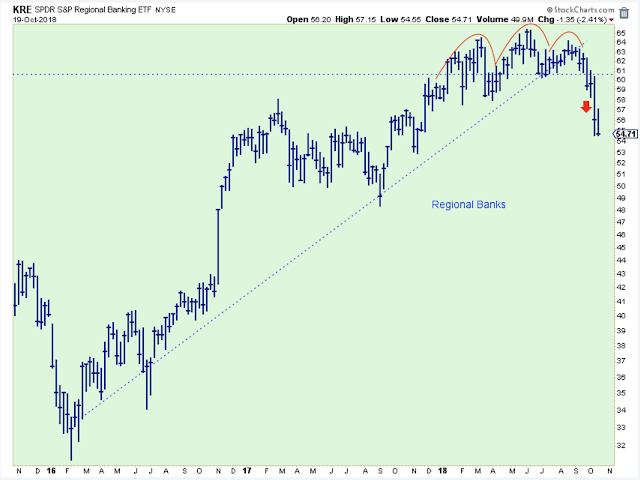 One of the early indications that there was a problem brewing in the market was the poor performance of the regional banks. Now they are showing a solid head-and-shoulders top. This is really good evidence of medium or intermediate-term weakness, but is the pattern enough to fit into making a case for a bull market top? I'd say no. 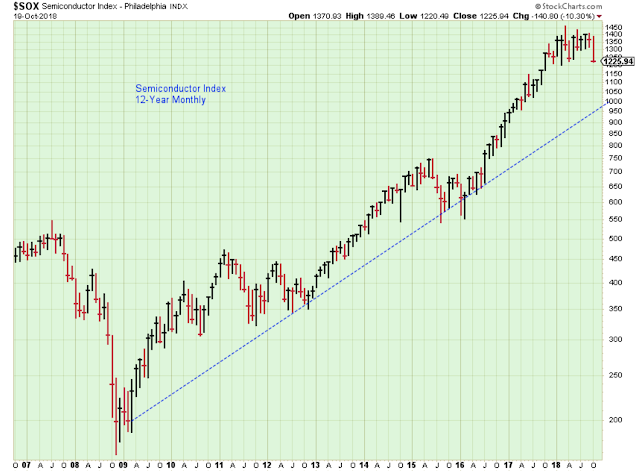 Here is a 12-Year monthly view of the same index. From the looks of this the longer-term uptrend remains intact. 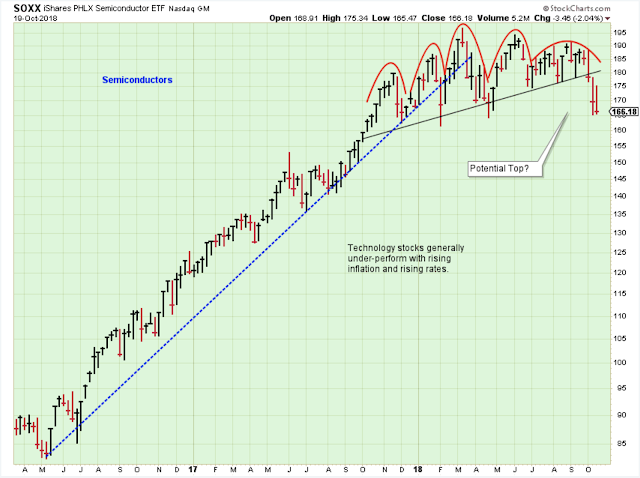 Here is the head-and-shoulders breakdown of the Semiconductors. These stocks have been this bull market's leaders, so I think a loss of this leadership is critical. I just don't see another group taking their place. 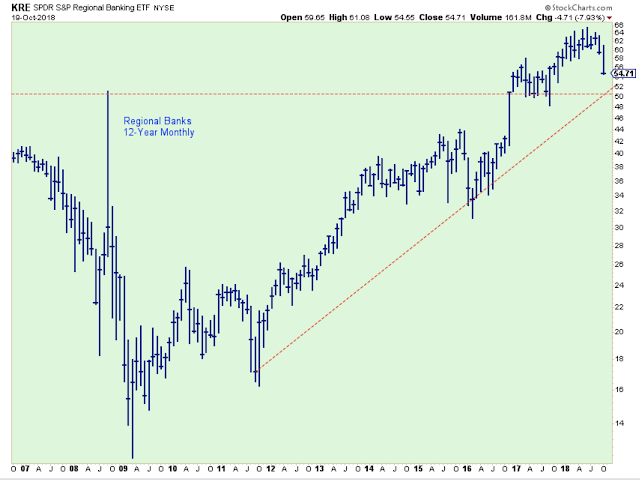 But is this chart pattern big enough to indicate a bull market top? Here is the 12-Year monthly of the Semiconductor Index, and it really has plenty of room to maneuver before breaking down. What to think? Below is the ECRI Economic Index, the Small Caps, and the rate-of-change for M2 growth. All three panels are now looking weak. The ECRI Index is key. A break down below the zero-level isn't the end of the world, but it is a sure sign of significant weakness. If there is a breakdown below the -5% level, then I will be completely out of stocks and I am assuming a recession will be starting. The small caps have broken below their uptrend line which is something that didn't happen during the ECRI weakness shown in October 2017. The strength in small caps was a hint that the ECRI would turn and head higher. The opposite is occurring now. M2 growth has been consistently weak for two years, and although it has stopped its decline, it hasn't shown strength either. I'd say that if you combine the three panels then you have a situation that does not favor higher stock prices. However, it still isn't enough to say that the bull market has topped out.